[LEL17] History of overseas riders on LEL. I've seen a reference to 2009 being the first year that substantial numbers of overseas riders completed LEL. 2001 was the first time that there was a 'London' start, from Harlow in Essex. It coincided with a start in Thorne. Harlow had a number of 'foreigners', but they are not listed in the results. At PBP 2003, there was an LEL stall, Ivo Meisen helped out. That recruited a lot of overseas participants, and AUK members were encouraged to take the Thorne start to make room for them at the LEA Valley YHA start. In 2005 there was a list of non-AUK finishers, but no names. There were also a small number of overseas riders starting from Thorne until 2009, when there was one start from 'London'. The LRM archives lists all finishers. Re: History of overseas riders on LEL. The advertising at PBP started already in 1999. A few AUK members, including myself, were present at teh LRM stand and were part-time assisting LRM, part-time advertising LEL. THis already led to a larger influx of foreign riders. During my first LEL, in 1997, there wer a handful, with a surprising amount of South-Africans. The only foreign language spoken during that LEL was a combination of Dutch and Afrikaans . The first larger groups to enter outside of this were a bunch of Italians starting in Harlow and a sizeable group of Germans. This was the result of the 1999 campaign at PBP. Italy just started as a randonneuring country in '95 with 3 riders at PBP, LEL was the first major ride with a larger Italian contingent. When Harlow started to be nearly full we directed a few riders to the Thorne start, they had a different experience as the Harlow starters. Harlow gave already an international feeling, Thorne was essentially an AUK ride with a few foreigners sitting in. BTW, the Harlow start did have an influence on the mudguard debate as it became clear how uncommon this rule was. In 2005 there were for the first time a few national coordinators in several countries, a policy which was expanded for 2009 (internet being a lot less common back then). The amount of foreigners started booming, especially for the Lea Valley start. The original idea of recruiting foreign riders came from Sheila who asked me to assist. I more or less served as international contact from 1999 to 2009. The 2005 LEL was the turning point, after this event the reputation of LEL immensely grew, with the result that after PBP 2007 all publicity was virtually halted since we would be overbooked anyway. This was the first time that it became apparant to me that LEL could reach more than 1000 participants, although not everyone believed this. To conclude, the internationalisation of LEL was a deliberate policy of people involved with running LEL and started back in the days of Bernie. AUK does have the full lists, stored separately. You need to look in the Results sidebar under 'LEL Finishers'. You can see that 1997 had 7 named overseas finishers including Ivo. The first were 3 Canadians in 1993, Manfred Kuchenmuller, Gordon Cook and Harold Bridge (DNF). 1989 was a different world. The Berlin Wall was still standing, Nelson Mandela was in jail, and Hong Kong would be staying British for another 8 years. Internationalisation was inevitable. The Thorne start meant that you got to see the main international element from the London start, at least twice. Passing them in Scotland, the fastest riders passing you heading to London, and the back markers crossing your path on the way back to Thorne. You'd also meet them in the controls. I remember seeing a group of Italians huddled around a space heater at Samye Ling in 2001. With Brexit upon us and British randonneurs unable to ride LEL this year due to massive influx of foreign riders, will 2017 be the last edition with riders from overseas? None of those facts are correct. In 1993 I was working in Glasgow and volunteered for LEL at the Edinburgh control. Of course my car had just been stolen, so I caught the train over to Edinburgh and rode my bike to the control. It was run out of a service station with not much in the way of food (I remember making lots of cheese sandwiches). I did the overnight shift on Saturday and handed over to Sonya Crawford in the morning. Ian & Suzie Gray came in early. About 20 years later when I was looking after the Audax booth at our Alpine Classic in Bright, Victoria in January when who should appear but Suzie - she was amazed when I said I remembered her from LEL in 1993. How things have changed, and what a brilliant world class event LEL has become. AUK, Danial, Phil, Roger and other organisers, controllers and volunteers should be so proud. 24 years after volunteering I can now say I’m an LEL finisher also. Closure. Ian and Suzie really lit up the Audax scene for the short time they were living here. Had they stayed longer Suzie might have torn the record books apart, she was very quick and never off the bike. Ian was disadvantaged by having a day-job to hold down (something in high-end banking), but nevertheless he won the Mersey 24 one year. I remember once during a convivial evening, for no apparent reason Suzie turned to Ian with a reproachful look and exclaimed in her sassy Aussie twang "When I first knew you, you were rock-'ard" and punched him in the stomach. Oh, how we all laughed. 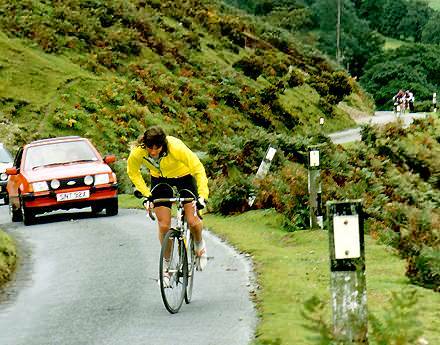 Here's Suzie attacking the difficult climb of Long Mynd (note that other cyclists in the distant background are walking).